The fascinating new FM 1811 is the culmination of FM ACOUSTICS efforts in 35 years of dedicated R&D. Not many words are needed to explain the FM 1811: it is the ultimate solution to highest accuracy in music reproduction. Of course, all characteristics that have made FM ACOUSTICS amplifier world renown - like singular discrete circuits, individually tuned and hand calibrated FM ACOUSTICS class A+ stages, use of hand-and-listening selected semiconductors etc. - are incorporated. The Resolution Series ® 1811 delivers unheard of realism and a "be there" experience for which neither words nor technical terms exist. The FM 1811 drives any speaker to a performance level that until now could not be imagined. Max. Output Voltage: 180 V pp. Absolutely unlimited peak current (over 550A). More than 80A continuous per channel allows the FM 1811 to drive any known load with optimal fidelity. No fuses, absolutely no form of current, voltage or any other kind of limiting are employed. Input: Proprietary, electronically balanced, discrete enhanced class A circuitry, floating ground, non-inverting or inverting mode. Optimal performance with either balanced or unbalanced (single-ended) sources. Unbalanced sources are automatically balanced right at the inputs of the FM 1811. 105 dB typically, better than 95 dB at 50Hz even better at other frequencies. Load Impedance: No minimum impedance. Designed for below 1 Ohm to above 10’000 Ohm systems. Can drive any speaker impedance - dynamic, electrostatic, ribbon, planar etc. - without any compression, limiting or any other negative effects on the audio signal. 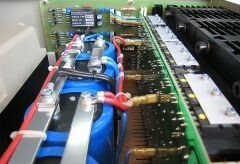 Despite this, the amplifier is fully protected against short circuits and all other adverse conditions via a unique onboard system that continuously surveys all important parameters. FM ACOUSTICS protect against adverse conditions such as short circuit, open circuit, HF Oscillation, RF interference, +DC and -DC offset, fan activity, temperature, blocked or dirty fan filters, damage to the protection system itself, etc. New dual chassis design effectively isolates sensitive electronic and mechanical components from potential negative influences such as induced resonances. Mechanical resonance damping on panels is employed. 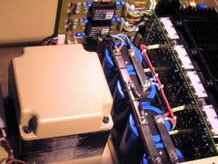 The whole chassis including cover, transformer mounting, transformer leaves, side panels, capacitor mounting etc. use anti-resonance technology. At 25oC ambient temperature, medium power, 10h/day, 365 days/year: 38 years. Continuous current handling = 200A,1200Ap FORCELINES 3 required.